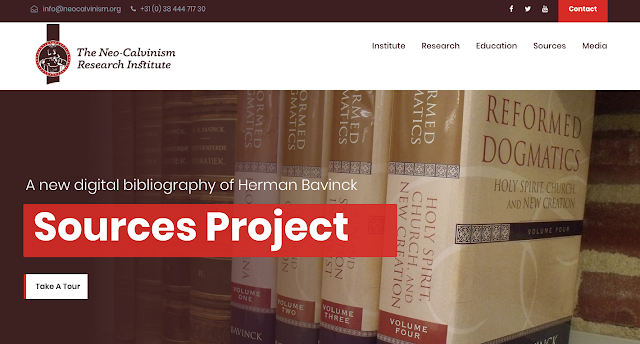 Herman Bavinck Lecture 2018 • Theologische Universiteit Kampen from TUKampen on Vimeo. Harinck looks at the Neo-Calvinism in international perspective. 1. In the past Christianity has largely been an 'export' from Europe. In the last century this has changed; Europe is no longer the centre. However, it has not been replaced by other centres; it has become poly-centric. 2. Neo-Calvinism has been previously studied under the history of ideas. However, ideas do not stand on their own, there is an economy of knowledge. Knowledge is not independent of context. Too long it has been thought of as a box of ideas, but now the stress is on interactivity. 3. Andrew Walls saw the spread of Christianity as a series of shifts marked by migration. Migration helps us to understand the transfer of neo-Calvinism to North America. There is a bilateral interaction - cross-pollination, where knowledge is less important than personal relationships. ideas are often the contexts. Harinck poses the question why was neo-Calvinism more attractive to North America than say, Scotland or Switzerland? He looks at three important heralds of neo-Calvinism in the US. The latest issue of Philosophia Reformata has been published. 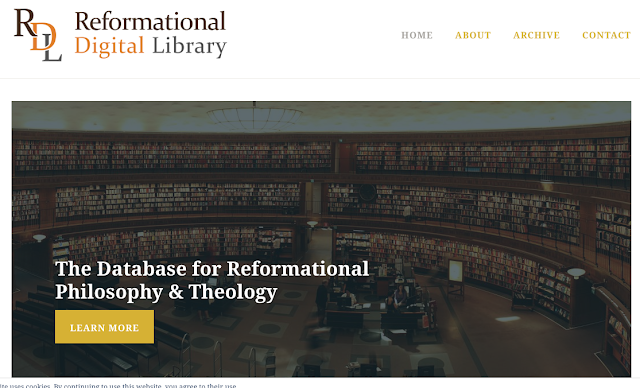 Peter Turkstra Library of Redeemer University College has details of books on Reformational philosophy. Check it out here. The Reformational Digital Library (RDL) is a resource-base rooted in the tradition of the reformational Christian philosophy developed by the Dutch polymath Herman Dooyeweerd. Specific attention is given towards literary works in which the systematic articulation and coherent advancement of this tradition is demonstrably evident. It is the central mission of the RDL to publish the best works of Dooyeweerd’s colleagues, students, and followers in order to elaborate and advance these revolutionary insights through books, articles, special lectures and speeches. Our emphasis is placed on those works within this new Christian philosophy in which there is demonstrable evidence of a self-conscious employment of the systematic analysis articulated in the Philosophy of the Cosmonomic Idea. We have adopted the general rubric “The Philosophy of the Cosmonomic Idea” which, in the contemporary Anglo-American arena, specifically identifies the form of analysis taken by this new Christian philosophy, rather than the older expression “The Philosophy of the Law Idea,”that was a translation of the title of Dooyeweerd’s three volume publication of 1935-36, De Wijsbegeerte der Wetsidee. By limiting the scope of our initial endeavors (at least in principle) to the more important systematic works, we hope to considerably narrow the parameters of the nevertheless daunting task before us. We believe that the Philosophy of The Cosmonomic Idea represents the first attempt in the history of the church to develop a systematically coherent, biblically-driven philosophy that is in fact self-consciously non-synthetic in nature. We are convinced that this Christian philosophy can provide a significant foundation for a coherent analysis of the entire diversity of the creation order. Ruben Alvarado is the person behind WordBridge Publications, the publishers of the recently translated book by P.J. Hoedemaker on the dispute over Article 36 of the Belgic Confession (details here). Below is my interview with Ruben. Could start by saying something about yourself? Who you are, what you do and where you have come from? I am an American citizen living in the Netherlands. My parents hail from Puerto Rico, a US possession in the Caribbean. That’s where my name comes from! My father being a career naval officer, I was born in Annapolis MD and raised in Virginia Beach VA. Following in his footsteps, I attended the US Naval Academy for two years, but being an undisciplined lout, I resigned and went to Virginia Tech, where I pursued a degree in forestry. During that period I converted to Christianity, which turned my life upside down. 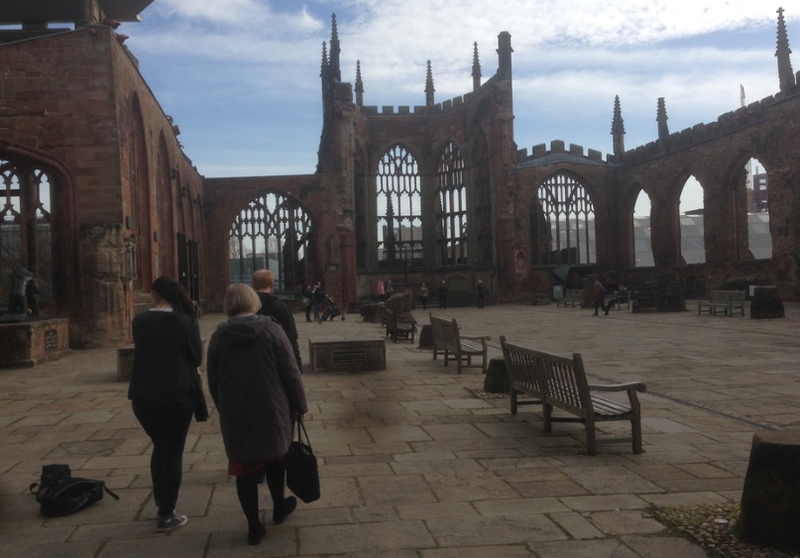 From that point I have been gripped with the conviction that the kingdom of God involves every area of life, and that my calling is to explore that and do my best to work it out theoretically. How did WordBridge Publishing come about? I moved to the Netherlands in 1990 in quest of a Dutch woman, with whom I have been married for 29 years now. One of the things that attracted me to her and her country was the theological inheritance they have. I had been reading Dutch theologians in translation, but wanted to master the language. Mission accomplished, I became a professional translator of business and financial news. Later I branched out to undertake my own projects, involving economics, law, and theology. WordBridge is the result of that. I was dissatisfied with the limited (i.e., zero) opportunities provided by existing publishers, and having already learned the ropes of book publishing, I started my own publishing firm, precisely to bring those translations onto the market. What sort of books are you interested in publishing? The three areas of inquiry that I think are most important are precisely the three that get short shrift in formal education: economics, law, and theology. For me, these are the core disciplines. I wish to publish in these three areas, and furthermore, to generate a synergistic interaction between the three, because they are interrelated. They all three have to do with balancing accounts. Economics revolves around accounting for credit and debt; law, around accounting for crime/tort and redress thereof; and theology, accounting for guilt and atonement. All of these have the same root. Do you think the emergence of electronic books will dent the market for paperback books? Will we still have paper books in twenty years time? Actually I don’t think so, except perhaps in the realm of mass-market paperbacks. In my own publishing experience, hardcopy outsells ebook format at a ratio of perhaps 10-to-1, if not more. I think in future people will use them both in tandem, especially for any kind of rigorous scientific work, as each has its advantages and disadvantages. One of the most recent of your publications is Article 36 by P.J. Hoedemaker. What was your aim and purpose in translating and publishing this book? As I said, I became engrossed in Dutch theological writing that was available in translation. Once I learned the language, however, I discovered other material that had not been translated. My wife was the one who first introduced me to this other stream. In America we know of Abraham Kuyper, he represents Dutch Reformed theology. But in the Netherlands Kuyper represents but one variation in the Dutch Reformed theme. The other major variant was provided by the national church, and the names were Hoedemaker, Noordmans, Van Ruler. Article 36 perhaps best represents this other school of thought. 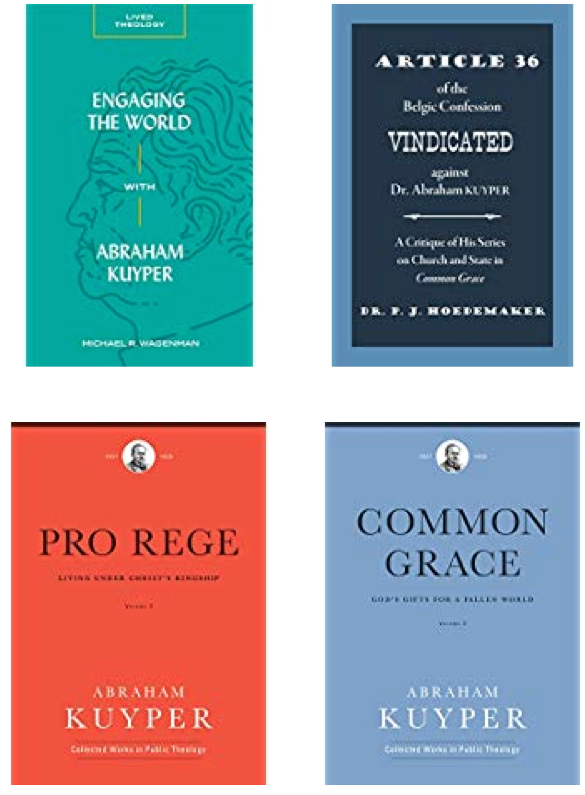 It takes on Kuyper’s church/state model head on, and vouches for another approach, more in line with historical Reformed thought, that of the Christian state and the publicly-recognized church, both of which Kuyper cast aside. Could you give some of the background to the book, for those who know little of Dutch Reformed history? For example, what is article 36? and who was HHoedemaker? Article 36 of the Belgic Confession argues that the civil magistrate should promote the true religion and “remove and prevent” idolatry and false religion. Kuyper argued that this meant that the Belgic Confession, and Calvin and the Reformed fathers generally, carried on the Roman Catholic inquisition. Hoedemaker debunks this criticism and shows that the Reformers argued in favor of freedom of conscience, but also required that the true religion be recognized by the state, as guideline for and restriction on state power. Hoedemaker himself has an interesting history, being born into a separatist family and having spent his teenage years in America. But he finally found his calling, not as a separatist or an advocate for a “free church in a free state,” as one might expect from his background, but as an advocate for the national church – “all the church for all the people,” as he put it. In his view, a national church organized along Presbyterian/conciliar lines provides a bulwark and foundation for the nation as a whole, beyond party politics, which drives people apart. Much of contemporary political conflict and culture war could be avoided if there were a national church which was grounded on Scripture and a solid confession of faith, such as the Netherlands had had and could have again. The people were certainly not opposed to it; it was the elites that time and time again worked against this ideal. What were the key disagreements between Kuyper and Hoedemaker? Kuyper advocated disestablishment, a neutral state, and Christians acting in the political sphere to realize Christian values (an extension of his doctrine of church-as-organism). Hoedemaker saw this as folly. It would lead to a secular state, rampant unbelief in public institutions; it would isolate Christians and push them into a ghetto. Who do you think was right Kuyper or Hoedemaker? I thought Hoedemaker was right even before I’d ever heard of him. It bothered me about Kuyper that he advocated the disestablishment of Christianity in public life, as is evident from his Lectures on Calvinism. Hoedemaker’s arguments, along with others like Van Ruler’s, are to me unanswerable. And after having translated Article 36, I think Hoedemaker ably dismantles Kuyper’s argument. Why is this book important for today? This can all seem like a hopeless tilting at windmills, but in fact the perspective Hoedemaker brings offers the only way out of the current impasse. We got on this track by embracing the neutral state. This has led to the silencing of the church – of the truth – and the triumph of opinion riding on power, exactly as Hoedemaker predicted. If Christians can recover a vision of the church as a unified body taking a public stand for the truth, then the state and the culture and the social order can be restored. But it will take Christians turning away from structural individualism and toward structural corporate life and action as the visible body of Christ to make this a reality. Where can potential readers get hold of the book? The book itself is available at all online bookstores. In North America, the WordBridge webstore is available as well. Check the website for more information: www.wordbridge.net. What other projects are in the pipeline for WordBridge? As a companion volume to Article 36, the other of Hoedemaker’s major books is being published as we speak. This would be Reformed Ecclesiology in an Age of Denominationalism. This book basically picks up where Article 36 leaves off, exploring the possibility of restoring the church to its role in public life. Furthermore, another book on ecclesiology is slated to be published, in which Adolph Harnack and Josef Bohatec take on Rudolph Sohm’s influential concept of the church. The former line up with the Reformed, while the latter is Lutheran. I also hope to publish a 20th-anniversary edition of my first book, A Common Law: The Law of Nations and Western Civilization. This book is especially timely now, in view of the controversy surrounding Brexit. It outlines the conflict within Western civilization between the common-law and civil-law orientations, the Anglo-American orbit reflecting common law, Continental Europe reflecting civil law. It is this conflict which with Brexit is surfacing again. I translate books. However, even that can get boring. So then, I also play guitar, sing in a choir, play tennis, and enjoy watching American sports over the internet thanks to web services that archive these events so you can watch them whenever you want. Having grown up in the 60s and 70s, I love pop and rock music from back then, but I also love classical music and can have some jazz, blues, country, bluegrass, here and there as well. And I really do love studying the Bible along the lines of the great themes: covenant, kingdom of God, baptism. Actually I’m reading the best book on Galatians I’ve yet to run across: The Blessing of Abraham, the Spirit, and Justification in Galatians by Chee-Chiew Lee, absolutely brilliant. Also, Herschepping (Recreation) by Oepke Noordmans. I’ve already translated his book on liturgy, and this is another I’d love to translate. Amazing insights you find nowhere else. And for diversion I’m reading Dickens’ Our Mutual Friend, which is plodding on forever, but is still captivating. If you were on a desert island what two luxuries would you take with you? Probably my e-reader full of select PDFs, and… assuming electricity, my laptop. I’d have to have something to write with, right? 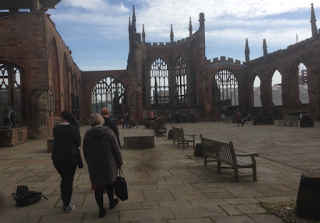 Around the ruins of Coventry Cathedral there are a number if prayer panels. 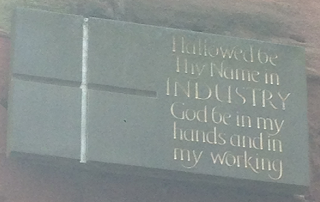 Hallowed be Thy name in industry. God be in my hands and in my making. 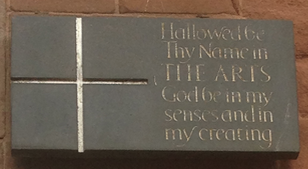 Hallowed be Thy name in arts. God be in my senses and in my creating. 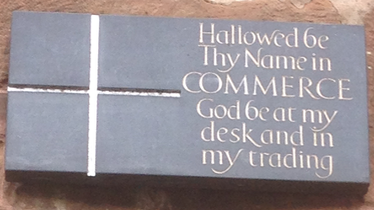 Hallowed be Thy name at home. 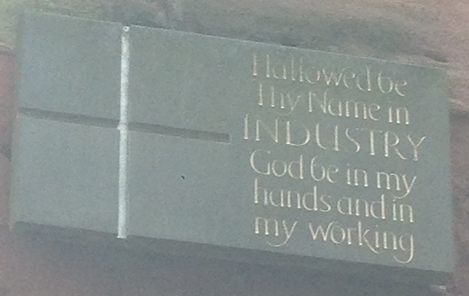 Hallowed be Thy name in commerce. God be in my desk and in my trading. 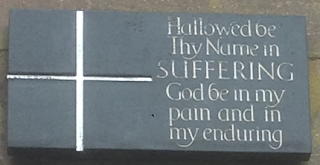 Hallowed be Thy name in suffering. God be in my pain and in my enduring. 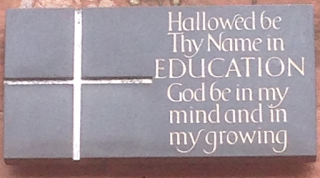 Hallowed be Thy name in Government. God be in my plans and in my deciding. Hallowed be Thy name in education. God be in my mind and in my growing. Hallowed by Thy name in recreation. 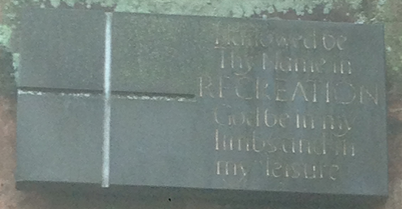 God be in my limbs and in my leisure. 2019 is looking like a great year for Kuyperania! and P.J. 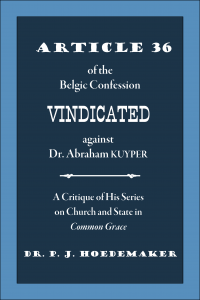 Hoedemaker's response to Kuyper regarding Article 36 of the Belgic Confession (Pantocrator Press).